Christmas 2012 now behind us and Father Christmas was very generous to me this year. 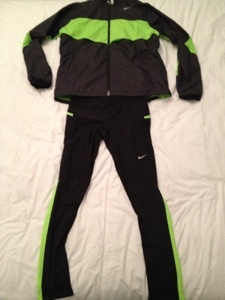 I am now the owner of a new pair trainers and some new training gear (pictured below). Over the festive period I have been speaking with a few of people who have offered me help with my training, Michael George has been advising me about training routes (and also when the local walking events are taking place). Richard Creer has offered to join me during some training sessions which will be a great help. My sister, Jo Healey has also offered to train with me and hopefully she'll enter the Parish Walk this year and attempt to finish it (she was annoyed at me for not giving her a name check in a previous post about my fantastic back up crew in 2011, so hopefully she'll be happy now). Just want to say thank you to anyone who has helped me so far and who has offered to help in the coming months! With a new year looming, I'm going to make my resolution to train hard... starting from the 2nd of January of course because New Year's Day lunch at my mother-in-law's can't be passed up and I won't be able to move after that! The week between Christmas and new year is always one that involves a lack of exercise and a whole lot of eating! Left over turkey, Tesco party food and the tin of Cadbury's Roses (which seems to be bottomless) are the order of the week and I'm unable to turn it down. I have not visited the scales in my bathroom for a couple of weeks and don't intend to until later on next week (fingers crossed that I've not passes the 12 stone mark!). I hope you all have a fantastic new year and its a prosperous one for all the 2013 Parish Walkers!